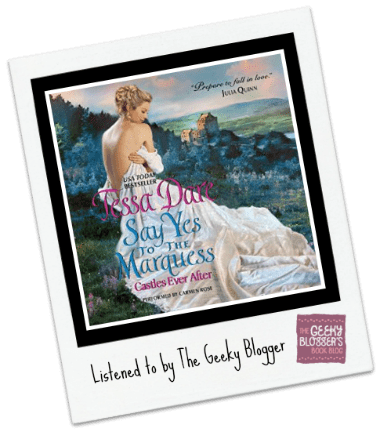 First Thought when Finished: Say Yes to the Marquess by Tessa Dare was a great way to end 2014! Rafe was so very Alpha (all protective and beat on your chest kind of way). Clio was smart as a whip (Yet she still managed to hold very well to the time–tricky to pull off but done very well). Together they made an unconventional pair that was a delight to read! I do so hope that Clio’s sister eventually will get a book (when she is a tad bit older). This is the 2nd Historical Romance (the other being Sophie Jordan’s Good Debutantes Guide to Ruin) that I have listened to narrated by Carmen Rose. She is becoming a narrator to watch for in my book. She handles the fine line of lady/spitfire very well! I’ve read so many great reviews for this book. I must go buy it right now! It sounds delightful and I haven’t listened to anything by Carmen Rose … on my wishlist! Just reading the description made me giggle. I *have* to have this. I love this series, looooove it! First book was one of my favorite books of 2013 and this one was a good contender in 2014. It’s on my Kindle but I haven’t had a chance to read it yet. Loved your review! Great review Felicia, I want to read this one! I really wanted to read this one for book club, but I ran out of time 🙁 Good to know that the audio is good!